Identification of the basic food hygiene principles for the purpose of delivering food which is safe to be used by the customers. Satisfying customers’ demands: The customer has always priority to be provided with a quality product and service, so we are trying to gain the confidence of our customers according to the legal provisions in the country. The customer has always priority, so we have to adapt to his/her demands and fulfill his/her wishes. Respecting the employees: By establishing contact with the employees, we keep informed about their problems, we solve them mutually and in this manner, we lay the foundations of a good team. Training of employees depending on the position they hold, by meeting the conditions of good hygiene practice for the purpose of maintaining the risks at an acceptable level. Continuously maintaining a partner relationship with the suppliers, leading to earning trust and continuing cooperation, as well as finding mutual solution to any potential problem which may occur. Compliance with the rules for providing a clean environment, which contributes towards good hygiene and removal of the potential negative effects. 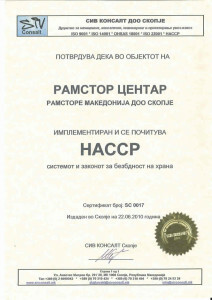 Implementation and maintenance of the Quality Management System in compliance with the requirements of HACCP according to CODEX ALIMENTARIUS CAC/RCP 1-1969, Rev. 4-2004. Our priority task is to improve quality and meet requirements by reducing the risks and maintaining them at an acceptable level.